How are Buddhism & yoga adapting in the West? Sharon Salzberg, Ganga White, Helen Goldstein & Soren Gordhamer break it down on an online panel. I responded, quickly and admittedly a little snarkily, “Yeah, I’m a Tantrika, I worship mainly in the charnel ground, you know, skulls and guts and stuff.” She and the other employees just looked at me. I ordered my Earl Grey tea and sat down and brewed about what it is to be “one of those yoga people,” and how my hat was somehow incongruous with that image. I steeped over how, although called a “yoga people,” I retorted with a Buddhist/yogi image. Maybe, I thought, I don’t know what I am either. Sunyata, “emptiness” – maybe better thought of as “openness,” is very important to me; that’s why I bought the skull hat. For me, openness is a meeting place of both yoga philosophy and Buddhism, two spiritual traditions that are currently flourishing in the West and two traditions that may or may not be understood in the context of popular culture or by their practitioners. 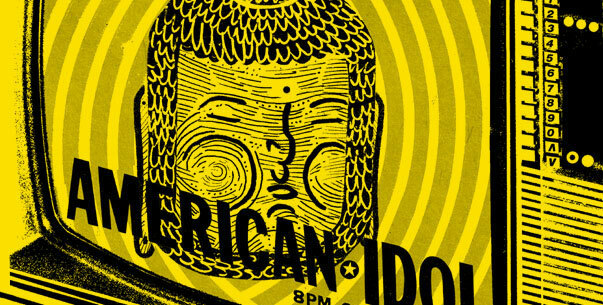 I’ve spoken to some practitioners who feel the popularization (and commercialization) of yoga and Buddhism in North America might undermine the integrity and very principles of the two spiritual traditions. While this is a valid concern, it’s important to recognize that yoga practice and Buddhism didn’t manifest in the West from a time bubble, unchanged from their “original” forms. Both disciplines have been translated into a number of languages and/or dialects, reinterpreted by a variety of cultures and experienced anew for thousands of years. When looked at in that way, it’s a wonder they arrived at all. The fact that Buddhism and yoga have arrived in the West points to both their applicability and adaptability. I say applicability because how else could two ideologies that demand so much from their practitioners have spread, without violence, unless people actually benefited from practising them? I say adaptability because there is something about Buddhism and yoga that allows room for personal interpretation and experience by whomever has the nerve to start on the path. In that way, the teachings continue to evolve through the unique interpretation of their practitioners while maintaining a link to their origins. 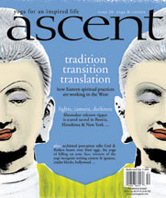 In light of all this, to go with ascent’s yoga and culture issue, I organized a panel with two Western yogis and two Western Buddhists to get their perspectives on how the traditions are manifesting in Western culture and where they’re headed. We conducted the panel online from various locations in North America: Ganga White from Santa Barbara, California, Helen Goldstein from Toronto, Ontario, Soren Gordhamer from Dixon, New Mexico, Sharon Salzberg from Barre, Massachusetts, and me, wearing my knitted skull hat in Kootenay Bay, British Columbia. – s.e.t. Sarah Truman: So, why Buddhism and yoga; why are they so popular in the West? Sharon Salzberg: Buddhism is based on individual realization rather than blind faith and that’s very suitable to Western culture. We’d rather rely on ourselves and our own effort. I think people appreciate how practical Buddhist teaching is and how it can be integrated into any kind of life. Soren Gordhamer: Buddhism and yoga are popular for very practical reasons: there is a tremendous amount of pain and suffering and thus a desire to be free of that pain and suffering, and many see yoga or meditation as practices that can help. Our suffering here may take different forms than what we see in Asia, but still I think more and more people are realizing the ways we all suffer – even those with the usual comforts of life taken care of. Helen Goldstein: In the West, many of us are looking for something more in life and our traditional religions are just not working for us anymore. The fact that we now live in a global village makes lots of information available in just moments, so what was once very exotic is now accessible. Sarah: History shows how both Buddhism and yoga have adapted to different cultures within Asia. Are there any unique ways that you have seen this adaptation expressed in the West? Helen: It’s interesting that the more striving practices have become so popular here in North America. We often hear about “Boot Camp Yoga” and “Yoga Booty.” Yoga often has that sense of striving to get somewhere or something – thinner thighs, less stress, rather than a practice that enhances one’s meditation. Sarah: I’m curious – how do you think the average person would stereotype a yogi and/or a Buddhist? Helen: I think that yogis are perceived as pretzels and Buddhists might be perceived as rather monkish. To me, though, it’s hard to separate the two. Ganga White: Yogi: a sprout-eating, soft, new-age, peaceful pretzel. However, the image is changing to one of a fit, buff, healthy, trendy, and hopefully, a modern thinker. Buddhist: a shaved-headed scholar, who speaks little and softly, and spends most of the time in his/her room. Soren: A yogi is a being on the way to enlightenment who likes to move; a Buddhist is a being on the way to enlightenment who likes to sit. Okay, total generalization, but not sure how else to do it. Sarah: Is there a risk in these generalizations? Sharon: If people think of Buddhism as an intellectual pursuit that neglects the heart and compassion, that’s obviously limiting. Helen: To me, the risk is that those who would benefit greatly from asana are intimidated by some of the portrayals they see in the media. And Buddhism, to some, is regarded as such a lifestyle change (do you really have to shave your head, wear robes, become a vegetarian, etc.?) that it might be scary. Soren: I think that Buddhists and yogis need to stand together in the truth and the shared values of awareness, nonviolence, inner development and other aspects that these traditions share. Ganga: The real questions, past or present, East or West, may be how to avoid superficiality, dogma and mediocrity. Sarah: Can you see a shared future between Buddhism and yoga outside of dogma and superficiality? Helen: Yoga and Buddhism are already connected. For me, meditation is a natural adjunct to a strong yoga practice. Soren: In the past there has been somewhat of a division between the meditation and yoga worlds, based on competition and a “whose path is better” approach, and I think this is lessening. It is important that this happens and expands to more people and groups. When there are interviews with faith leaders on CNN about moral issues, I would love to see someone from this panel involved in their discussions. I think we need strong spiritual leaders who are not promoting the “my way or the highway to hell” approach…maybe the “highway to hell approach” was a bit strong, but I do think we need to learn to live together in our uniqueness. Ganga: Many people believe Buddha was a yogi. There are so many parallels in the two traditions. But there are also great differences and variations even within each tradition. Science may have actually helped the connections by disproving outmoded beliefs and superstitions. With billions of people sharing this small planet, diversity is here to stay and part of the richness and fabric of life. On second thought, we have to be careful to preserve all forms of our diversity, avoiding the homogenization from media and globalization. Sarah: Do you feel that within the diversity of the modern world these practices are being treated respectfully? Helen: Well, I do feel that the practices of yoga and Buddhism have become very trendy and groovy. The biggest threat for me is that the teachings become so mainstream, used in advertising and popular culture, that they could lose their impact. Soren: I used to be more concerned about this. But now I figure people will do what they will with yoga and Buddhism – present them as groovy or not – people will still be drawn to the practices and teachings with heart, and not those out for the money or other motives. The heart is what will carry forth the practices in the end. Ganga: One of the earliest media presentations of yoga was on TV by Hittleman. I heard many complaints about its oversimplification and commercialization, but in the end it turned thousands on to going deeper. Anything and everything can cut both ways. These trends can expand and spread the teachings, but also water them down or make them trivial. Helen: I agree with both of you. Whatever it takes to bring people to the teachings, whatever their reasons – be it thin thighs or stress relief. The bottom line is that they and the rest of the world are going to benefit in a huge way from these practices, whether they know it or not. Soren: What can we actually do to stop the practices from being presented in mass culture in various ways? I am not sure we have much power over that, but it may be a reminder to make sure that what we do has as much integrity as possible – whether it is with the mass media or not. Ganga: Good point, we have to deal with what is…mass media seems to be here to stay. Sharon: There can also be a careful presentation of the teachings in a medium of mass culture. If I’m writing for a popular magazine, I don’t change what I’m going to say but more likely how I’m saying it. Sarah: How do you as practitioners and teachers in North America keep the teachings “authentic”? Ganga: What makes them authentic even in India? I think there are two camps – one that sees the teachings, or truth, as revealed in the past and, in a sense, fixed, permanent for all time. The other perspective sees them as always growing, evolving and changing like life. Authenticity has more to do with sharing the awakening of insight, love, compassion and wisdom than accurately repeating a teaching, belief or doctrine. Soren: I find prayer/expressing intention very useful: May I live the teachings and be shown the path to live them more fully? May I be guided to do so? Expressing and setting this intention helps me. I also think that the practice of humility is so important. Do we welcome situations that encourage humility or do we run away from them? Sharon: As a teacher I try to stay a practitioner, which helps a lot. I have teachers of my own who connect me to an authentic transmission. I think study is really important, too. Sarah: How important is it to have a “teacher” when studying yoga or Buddhism? Sharon: For the practice of humility, a teacher can be very helpful. In Buddhism, one’s own practice is the most important thing and I do believe over time we’ll see what we’re holding onto or ways we’re out of balance, but a teacher can hasten that process. They also inspire us when we can’t imagine why we’re doing what we’re doing. Ganga: Teachers, books and teachings are very important, but “a teacher” in the sense of only one may be limited, unless you believe that one person can contain all wisdom. I think students need to follow their hearts, and their heads. Teachers and teachings that promote following only one usually lead to authoritarianism. The common statement in Eastern spiritual circles is that there are many paths to truth, all leading to the same place. What if there is no path to truth? Spirituality, truth and enlightened living may be a moving target, something living, growing always into new expression and possibility. Then we must learn to be awake and vigilant each moment, rather than to follow. This doesn’t imply there is no role for teachers. Helen: I agree with you, Ganga. There is no one way. There are many paths, many teachers. But I think it’s also important to have someone guide you, mentor you and challenge you. Soren: To me it also comes back to intention and what is motivating or drawing us – are we avoiding a teacher because we do not trust others, or are we seeking a teacher because we are not okay with ourselves? In the end, I think teachers are incredibly valuable, but I do not like the idea that one “has” to have one to advance. I do think people in North America are more interested in innovation than in upholding traditions. This is likely both a strength and weakness – a weakness if we are not aware of it. Sharon: I agree with Soren about how much comes down to our own intention. But it’s really hard for many of us to sustain that intention without the support of a teacher or community. Soren: I agree. I have also found that many people find a great community and support through the books and tapes that have been published. Sarah: The merits of media! Are there any useful examples you can give of how you’ve seen Buddhism and yoga adopted into popular culture and media? Ganga: Yes! How about us – several yogis and Buddhists sharing and brainstorming from all parts of the world via satellite and instant messaging! And the vast myriad of different teachings and beliefs cross-pollinating around the globe faster, on scales and in ways never seen before. Sharon: Many popular magazines have articles these days on topics like sympathetic joy, altruism, etc. Also, scientific research is being developed on the benefits of meditation. Time magazine’s cover story on happiness a couple of weeks ago included Richie Davidson’s research and a photo of a Tibetan Buddhist monk being prepped for an MRI. The fact that an image like that is being associated with happiness in our culture is an amazing thing. Soren: To me the question is, what is next? Do we come together to form political action groups that many other religions have to push forward their interests – or do we operate in a completely different, more silent, less organized way? Sarah: So, what is next? Ganga: In this time of accelerated change and mutation I don’t know if we can really know where we’re headed. It’s hard to predict higher levels of order. Let’s hope that is what’s coming, though! Sarah: Is there a risk of Buddhism and yoga becoming consumer goods? Helen: I believe that we’re moving in a very conscious direction. As long as the practices are treated respectfully, and so far they seem to be, it’s good. Ganga: Consumerism and “spiritual materialism” – or seeing spirituality as an accumulation of merit, practices, goods and garbs – has always been a problem. Yoga and Buddhism must be the catalysts to trigger critical, dynamic awareness that will reveal these mechanical pitfalls and allow us to move forward. Asking these questions, questioning our own actions, the teachings and what we are creating, is part of the light that will guide these changes. Helen Goldstein is the founder and director of The Yoga Studio in Toronto, ON, Canada. She has been teaching and practicing yoga for over 20 years. Soren Gordhamer is the author of the meditation book for teens Just Say OM! and founder of the Lineage Project in New York City. Sharon Salzberg has been a student of Buddhism since 1971. She is a co-founder of the Insight Meditation Society in Barre, MA and The Barre Center for Buddhist Studies. Her latest book is Faith: Trusting Your Own Deepest Experience (Riverhead Books). Ganga White , founder/president of White Lotus Yoga Foundation, established in 1968, is the author of Double Yoga, co-author of the best selling Flow Series videos, and author of the upcoming Yoga Beyond Tradition. Contact: www.whitelotus.org. Sarah E. Truman is the editor of ascent magazine.